Spiroplasma poulsonii is a maternally transmitted bacterial endosymbiont that is naturally associated with Drosophila melanogaster. S. poulsonii resides extracellularly in the hemolymph, where it must acquire metabolites to sustain proliferation. In this study, we find that Spiroplasma proliferation specifically depletes host hemolymph diacylglyceride, the major lipid class transported by the lipoprotein, Lpp. 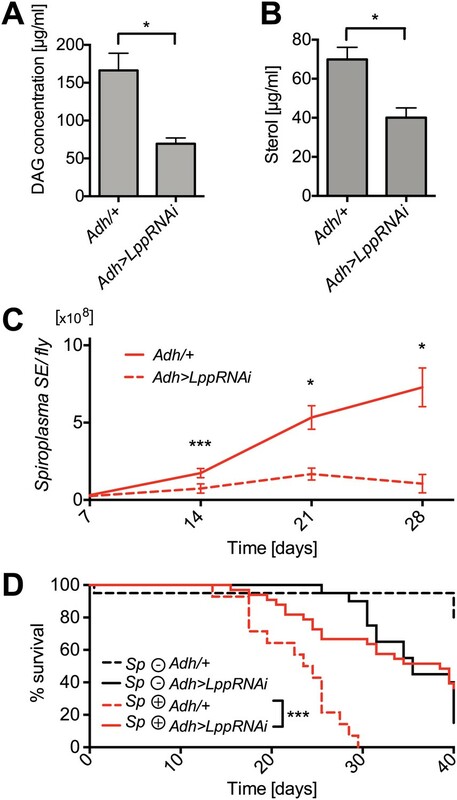 RNAi-mediated knockdown of Lpp expression, which reduces the amount of circulating lipids, inhibits Spiroplasma proliferation demonstrating that bacterial proliferation requires hemolymph-lipids. Altogether, our study shows that an insect endosymbiont acquires specific lipidic metabolites from the transport lipoproteins in the hemolymph of its host. In addition, we show that the proliferation of this endosymbiont is limited by the availability of hemolymph lipids. This feature could limit endosymbiont over-proliferation under conditions of host nutrient limitation as lipid availability is strongly influenced by the nutritional state. All animals host a large number of harmless microbes. Often the two partners involved in these interactions will depend on each other to thrive: microbes support important host functions and in return the host provides a safe place to live and a continuous supply of food. Many microbes that are intimately associated with animals have lost the ability to gain nutrients from sources other than their host and are unable to survive on their own. However, in many cases, the source and the type of nutrients provided to the microbes are unknown. One of the most common microbial species found in insects is Spiroplasma. This microbe lives in very large numbers in the fluid that fills the body cavities of insects, called the hemolymph. The microbes are transmitted from mother to offspring, and in some circumstances can provide benefits to the insects; for instance, Spiroplasma-infested flies appear to be protected against infection by some parasites. Unfortunately, as it is difficult to study insect–microbe relationships, little else is known about the physiological interactions between these two species. Herren et al. studied the association between Spiroplasma and the fly Drosophila melanogaster. Under normal conditions, Spiroplasma only reduces the life span of the infested fly. This indicates that Spiroplasma has a low impact on the general fitness of its host, only negatively affecting the survival and egg laying ability of old flies. When flies had limited access to nutrients, the number of Spiroplasma they carried was reduced, without the flies losing fitness. This suggests that Spiroplasma growth is dependent on something in the flies' diet. To understand which nutrients are important for the growth of Spiroplasma in Drosophila, Herren et al. analyzed the hemolymph of flies and found that there are fewer fatty-molecules, called lipids, when nutrients are limited. Healthy flies carrying Spiroplasma also have fewer lipids in their hemolymph, suggesting that these are what Spiroplasma feed on. Indeed, inactivating a protein required by the fly to transport lipids to the hemolymph reduced the growth of Spiroplasma in these flies. Herren et al. concluded that the growth of Spiroplasma inside its host is limited by the availability of lipids in the hemolymph. Since this is dependent on diet, the dependence on lipids couples the growth of Spiroplasma to the nutritional state of its host. Herren et al. speculate that this mechanism reduces the fitness cost of harboring the microbes and prevents the damaging consequence of an uncontrolled proliferation of the microbes. Moreover, Spiroplasma's preference for lipids may explain why it helps to protect flies against parasitic infection, as many parasites also rely on lipids for their growth. Herren et al. suggest this strategy could also be used in other animal–microbe associations. Many insects harbor facultative bacterial endosymbionts, which despite not being required for host survival have important implications for host biology (Wernegreen, 2012). Two of the most prevalent and well-characterized facultative insect endosymbionts are Wolbachia and Spiroplasma, which are estimated to infect ∼40% and 5–10% of all insects species, respectively (Hackett and Clark, 1979; Duron et al., 2008; Hilgenboecker et al., 2008). While Wolbachia principally resides intracellularly (Dobson et al., 1999; Albertson et al., 2009), Spiroplasma occupies an extracellular niche, proliferating mainly in the hemolymph that fills the body cavity of arthropods (Sakaguchi and Poulson, 1961; Anbutsu and Fukatsu, 2006). Spiroplasma and Wolbachia are both maternally transmitted and have developed unique strategies to colonize the germline of their female hosts for transmission to the next generation (Frydman et al., 2006; Serbus and Sullivan, 2007; Herren et al., 2013). Facultative endosymbionts with strict maternal transmission, including Wolbachia and Spiroplasma, increase their prevalence in host populations by virtue of two strategies: (i) manipulating host reproduction to increase the fitness of infected hosts (Werren and O'Neill, 1997); (ii) inducing a direct increase in host fitness in a manner that is usually condition dependent, for example protecting hosts against different classes of parasites (Hedges et al., 2008; Jaenike et al., 2010; Teixeira et al., 2008). Protective endosymbionts of disease vectors may be useful for the control of vector borne disease, and they are increasingly being studied in this context (Moreira et al., 2009). While these interactions are clearly of importance, more fundamental features of facultative endosymbioses are poorly understood and frequently overlooked, including metabolic exchanges and the mitigation of host fitness costs. Genome sequencing has indicated that endosymbiotic bacteria have highly reduced metabolic capacities and depend heavily on their hosts to provide them with a diversity of compounds needed for their sustained proliferation (Klein et al., 2012; Moran et al., 2008). However, the direct study of the metabolism of endosymbiotic bacteria is challenging, due to the high level of integration and interdependence between endosymbionts and their hosts. Therefore, despite a general, genome-centric understanding of the metabolic capacities of numerous endosymbionts, little is known about the nature of specific metabolites required for endosymbiont proliferation and the implications of metabolite acquisition by endosymbionts on host physiology and fitness. Strict maternal transmission is expected to result in the evolution of endosymbionts that have minimized host fitness costs (Werren and O'Neill, 1997). Experimental studies are generally in line with this prediction, for example Wolbachia and Spiroplasma have relatively minor effects on host fitness (Martins et al., 2010; Unckless and Jaenike, 2012), however, fitness costs usually become apparent as hosts age (Ebbert, 1991; Min and Benzer, 1997; Fry et al., 2004). For endosymbionts that colonize the germline from the adult soma, it has been demonstrated that endosymbiont titers are positively correlated with transmission fidelity (Dyer et al., 2005; Unckless et al., 2009). In general, endosymbiont titers (and hence proliferation rates) will therefore be determined by a compromise between the need to minimize host fitness costs and maximize transmission fidelity (Jaenike, 2009). Since host fitness costs are most likely minimized by the limiting excessive endosymbiont proliferation, the factors that limit endosymbiont proliferation are of central importance for the biology of endosymbionts; however, few mechanisms that are capable of limiting endosymbiont proliferation have been identified (Login et al., 2011). The proliferation of bacteria is often controlled by host immune systems; however, it is notable certain endosymbionts, including Spiroplasma, are not susceptible to host immune responses (Herren and Lemaitre, 2011) suggesting that other factors are likely to be of importance for limiting their proliferation. In this study, we used the genetically tractable insect, Drosophila melanogaster and its endosymbiotic Spiroplasma (MSRO strain) to analyze the mechanisms that govern Spiroplasma proliferation and the effects of endosymbiont proliferation on host physiology. We find that under normal rearing conditions MSRO Spiroplasma (henceforth referred to as Spiroplasma) shortens the life span of its host, D. melanogaster. Interestingly, under nutrient limitation, where increased competition between Spiroplasma and its host could be expected, Spiroplasma proliferation is compromised with minimal effect on host fitness. We noted that under nutrient limitation, host hemolymph lipids decline significantly and that under normal rearing conditions, the first observable effect of Spiroplasma-infection on host physiology is a depletion of host lipids. We then used RNAi-based strategies to reduce the hemolymph lipid concentration and find that this inhibits Spiroplasma proliferation and extends the life span of Spiroplasma-harboring flies. We therefore demonstrate that: (i) specific hemolymph lipids are utilized by Spiroplasma and (ii) the availability of hemolymph-lipids limits the proliferation of Spiroplasma. We investigated the impact of harboring Spiroplasma on its host's fitness by measuring survival and egg production in both virgin and mated Spiroplasma-infected and uninfected female flies. 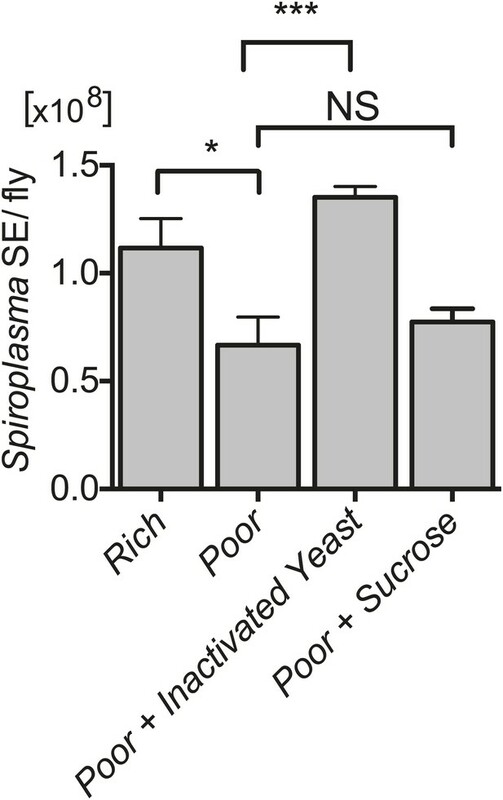 When maintained on a rich Drosophila diet, flies-harboring Spiroplasma have a significantly shortened life span compared to flies that do not harbor Spiroplasma (Figure 1A, Figure 1—figure supplement 1A), which is in agreement with a previous study on Drosophila willistoni and WSRO Spiroplasma (Ebbert, 1991). Notably, the presence of Spiroplasma did not significantly affect the death rate until flies were about 21–25 days old but flies began to exhibit signs of Spiroplasma-induced pathology between 14 and 21 days, as demonstrated by decreased performance in climbing assays (Figure 1B). Prior to death, aged Spiroplasma-harboring flies exhibit an apparent lack of coordination and tremors. The increase in Spiroplasma-induced lethality and pathology in old flies correlates with the increase of Spiroplasma titers, observed by qPCR of whole flies (Figure 1C) and fluorescence microscopy of hemolymph (Figure 1D). Consistent with previous studies on other Drosophila-endosymbiotic Spiroplasma strains (Anbutsu and Fukatsu, 2003; Haselkorn et al., 2013), we noticed that Spiroplasma titers reached a plateau in old flies (age >28 days) suggesting that a factor might limit Spiroplasma proliferation at this stage. In light of the finding that Spiroplama reduces fly life span and the apparent trade-off between life span and reproductive output in Drosophila (Partridge et al., 1987; Sgrò and Partridge, 1999), we also compared the rate of egg production between Spiroplasma-infected and uninfected females. There was a twofold increase in the number of eggs laid by Spiroplasma-infected virgin flies compared to Spiroplasma-uninfected virgin flies over 14 days (Figure 1E). The number of eggs laid by Spiroplasma-infected mated flies over a 14-day period was similar to Spiroplasma-uninfected mated flies, however, Spiroplasma-infected mated flies laid an increased number of eggs in the first 2 days post-eclosion (Figure 1—figure supplement 1B). These results indicate that the presence of Spiroplasma stimulates egg production in virgin flies and also in mated flies over the first 2 days post eclosion, while causing a minor decline in egg production of mated flies at later time points. Collectively, these experiments demonstrate that (i) Spiroplasma has a low impact on the general fitness of its host, negatively affecting survival and egg laying only in old flies and (ii) that this decrease in host fitness correlates with higher Spiroplasma titers. Spiroplasma proliferation is associated with life span reduction. (A) Life span of virgin flies-harboring Spiroplasma (Sp (+)) relative to control flies that do not harbor Spiroplasma (Sp (−)) when kept on a rich Drosophila diet. ***p<0.0001, N = 50 flies per condition. Shown is one representative experiment out of three independent experiments. (B) The climbing activity of virgin flies-harboring Spiroplasma (Sp (+)) relative to uninfected flies (Sp (−)) over time. ***p<0.0001, N = 20 flies per condition. Shown is one representative experiment out of three independent experiments. (C) qPCR quantification of the titers of Spiroplasma in virgin flies over aging. Values for each timepoint have at least three samples (five flies pooled per sample). Shown is one representative experiment out of three independent experiments. (D) Fluorescent microscopy images depicting SYTO-9 stained Spiroplasma in Drosophila hemolymph at 7 days (D1) and 21 days (D2) of fly age. (E) The number of eggs laid by virgin flies-harboring Spiroplasma (Sp (+)) relative to control flies that do not harbor Spiroplasma (Sp (−)), in total over 14 days (left panel) and in 2-day period over 14 days (right panel). In total, Spiroplasma-infected virgin flies laid significantly more eggs. *p=0.02. Shown is the mean ± SEM of data pooled from four independent experiments, N = 20 flies per experiment. We had initially speculated that the competition for resources between Spiroplasma and its host would be more conspicuous upon nutrient scarcity and that under these conditions Spiroplasma might have a more detrimental effect on host fitness. To test this hypothesis, we maintained adult flies on a nutrient poor diet. Under these nutrient-limiting conditions, Drosophila survival is significantly compromised, however it is important to note that this diet still contains sufficient nutritional content to support an entire Drosophila life-cycle (Vijendravarma et al., 2012). It is also worth mentioning that we only examined the effects of nutrient deprivation in adult flies and that for all the experiments conducted Drosophila larvae were raised under normal conditions. Surprisingly, Spiroplasma-infected and uninfected virgin flies had a similar life span (Figure 2A) and produced similar numbers of eggs under nutrient-limiting conditions (Figure 2B). For mated flies under nutrient limitation, harboring Spiroplasma resulted in a minor reduction in survival relative to flies that did not harbor Spiroplasma (Figure 2—figure supplement 1A). Spiroplasma-infected mated flies produced more eggs than Spiroplasma-uninfected mated flies under nutrient-limiting conditions (Figure 2—figure supplement 1B). These findings suggest that, in contrast to our initial hypothesis, harboring Spiroplasma has a rather limited fitness cost under nutrient-limiting conditions. Importantly, we observed that Spiroplasma proliferation in whole flies (Figure 2B) and hemolymph (Figure 2—figure supplement 2) was also significantly inhibited when flies are maintained on a nutrient poor diet. Thus, the inhibition of Spiroplasma proliferation in flies that are maintained under nutrient-limiting conditions could explain why Spiroplasma has limited fitness costs under these conditions. For consistency, and to facilitate the maintenance of flies under identical conditions, subsequent experiments were carried out on virgin females (unless otherwise specified). The implications of harboring Spiroplasma under host nutritional depravation. (A) Survival of virgin flies on a nutritionally poor diet. Flies-harboring Spiroplasma (Sp (+)) do not have significantly different mortality from flies that do not harbor Spiroplasma (Sp (−)). NS (p=0.9378). N = 50 flies per condition. Shown is one representative experiment out of three independent experiments. (B) The number of eggs laid by virgin flies-harboring Spiroplasma (Sp (+)) relative to control flies that do not harbor Spiroplasma (Sp (−)), in total over 14 days (left panel) and in 2-day period over 14 days (right panel). Overall, there is no significant difference in the number of eggs laid between Spiroplasma-infected and uninfected virgin flies under nutrient deprivation. NS (p=0.77). Shown is the mean ± SEM of data pooled from four independent experiments, N = 20 flies per experiment. (C) Quantification of Spiroplasma titers by qPCR reveals that virgin female flies maintained on the same nutritionally poor diet as in panel A have significantly lower Spiroplasma titers after 8 and 12 days than flies maintained on a rich diet. *p=0.015 and ***p=0.0002, respectively. Values for each time-point have at least three samples (five flies pooled per sample). Shown is the mean ± SEM of one representative experiment out of the three independent experiments that were conducted. The results above suggest that Spiroplasma proliferation might be dependent on the availability of host factors that are nutritional state-dependent. To identify these factors, we examined the effect that maintaining uninfected flies for 12 days on a nutrient poor diet had on the concentration of metabolites in the hemolymph (where Spiroplasma reside). We found that raising flies on a nutrient poor diet resulted in significantly lower concentrations of protein, sterol and diacylglyceride (DAG, the main transport lipid in Drosophila) (Figure 3A–C), while levels of glucose and trehalose were not changed significantly (Figure 3—figure supplement 1A,B) and L-amino acids increased (Figure 3—figure supplement 1C). Thus, nutrient limitation led to a specific decline in hemolymphatic protein and lipid concentrations. We then complemented the nutrient poor diet with either inactivated yeast (rich in protein and lipids) or sucrose, we found that only inactivated yeast extract was able to recover the Spiroplasma proliferation rates observed on rich media (Figure 4). This indicates that Spiroplasma proliferation is not only affected by the caloric content of the food but by the composition of the diet. Taken together, these results lend support to the hypothesis that Spiroplasma proliferation is heavily dependent on hemolymph metabolite composition and that certain metabolites (e.g., lipids and protein) could play a more important role than others (e.g., sugars). Nutrient deprivation depletes host lipids. (A–C) The protein (A), sterol (B), and DAG (C) concentration of the hemolymph of flies maintained on nutritionally poor diets for 12 days is significantly lowered relative to flies maintained on a nutritionally rich diet. Mean ± SEM of three independent experiments is shown, *p=0.038, *p=0.023, and **p=0.0018, respectively. Spiroplasma proliferation is influenced by the nutrient composition of the diet. Quantification of Spiroplasma titers by qPCR reveals that complementing nutrient poor media with inactivated yeast results in a significant increase in Spiroplasma titers after 12 days. ***p=0.0003. In contrast, complementing nutrient poor media with sucrose does not significantly increase Spiroplasma titers. NS (p=0.5). Values are the mean ± SEM of at least four samples (five flies per sample). Shown is one representative experiment out of the three independent experiments that were conducted. To gain a better insight into the relationship between Spiroplasma and host physiology, we monitored the effects of harboring Spiroplasma on the concentration of metabolites in the hemolymph of flies raised on a rich diet. We observed that the concentration of measured sugars was not changed and that the L-amino acid concentration was even increased in the presence of Spiroplasma (Figure 5A–C). We also found that the hemolymph of flies-harboring Spiroplasma had an increased concentration of proteins and sterol (Figure 5D,E). However, after centrifugation to remove bacterial cells, the protein and sterol concentration was no longer significantly different between Spiroplasma-infected and Spiroplasma-uninfected hemolymph samples. This suggests that Spiroplasma cells contain a substantial amount of proteins and sterol, but that the presence of this endosymbiont does not deplete either of these factors in the hemolymph. Notably, we observed that Spiroplasma-infected flies experienced a significant drop in the concentration of DAG within the hemolymph (Figure 5F). 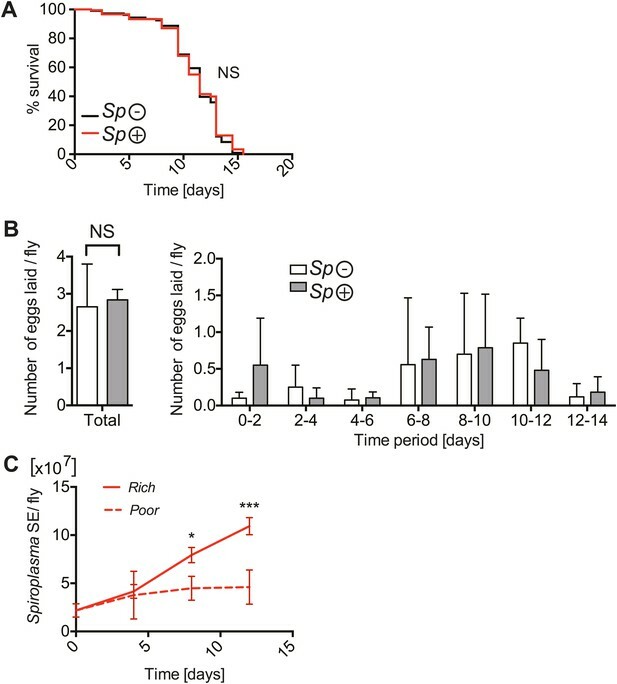 Importantly, this difference is not caused by the previously noted differences in the rate of egg production between Spiroplasma-infected and Spiroplasma-uninfected virgin flies, as a decrease in DAG was also observed in mated flies (Figure 5—figure supplement 1A), where Spiroplasma did not affect the number of eggs laid over 14 days (Figure 1—figure supplement 1B). We also observed that there was a more marked decline in DAG levels in 28-day-old Spiroplasma-infected relative to uninfected flies (Figure 5—figure supplement 1B), where Spiroplasma titers have nearly reached their maximum levels (Figure 1C) and egg production declines (David et al., 1975; Partridge et al., 1987). We then investigated the impact of Spiroplasma on metabolite storage in the fat body by quantifying the amount of triacylglyceride (TAG, the main storage lipid in Drosophila) and glycogen (the main storage carbohydrate in Drosophila). Quantifications of whole female flies (reflecting mainly insect fat body energy storage but also the energy contents of the ovaries) showed a decrease in the amount of TAG in Spiroplasma-infected flies compared to Spiroplasma-uninfected flies (Figure 5G), while the amount of glycogen was not affected by the presence of Spiroplasma (Figure 5—figure supplement 2). Consistent with the decrease in TAG reserves, 12-day-old Spiroplasma-infected flies succumb more rapidly to acute starvation, in which flies are only given a source of water but no source of nutrition (Figure 5H). Since TAG stored in the fat body largely derived from hemolymph DAG (Canavoso et al., 2001), the decrease of TAG is likely to be the outcome of the depletion of hemolymphatic DAG by Spiroplasma. Thus, our analyses show that the proliferation of Spiroplasma in flies is associated with a specific depletion of hemolymph DAG as well as a decrease in the amount of fat body lipid storage. These findings, together with the observation that DAG is depleted under nutrient deprivation, suggest that DAG availability limits Spiroplasma proliferation. Spiroplasma infection depletes lipids of Drosophila maintained under normal conditions. Quantification of metabolites in flies that have been maintained on rich media for 12 days. Glucose (A), trehalose (B), and L-amino acid (C) concentration within the hemolymph of uninfected flies (Sp (−)) and Spiroplasma-infected flies (Sp (+)). L-amino acid concentration in the hemolymph is significantly higher in Spiroplasma-infected flies while glucose and trehalose concentrations remain unchanged. Mean ± SEM of three independent experiments is shown, NS (p=0.798 and p=0.977) and **p=0.0056. 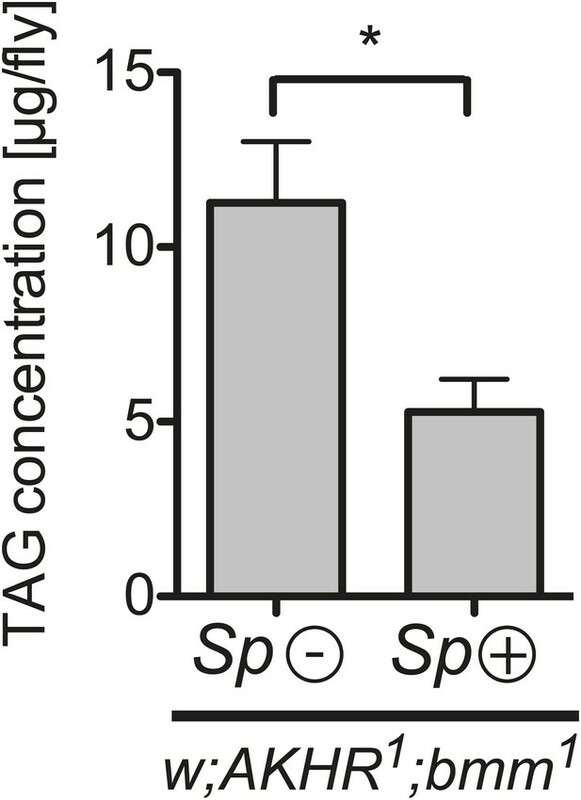 (D–E) Quantifications of protein (D) and sterol (E) concentration in hemolymph from flies that harbor Spiroplasma (Sp (+)) and uninfected flies (Sp (−)). Hemolymph samples denoted as ‘supernatant’ have been subjected to an additional centrifugation to remove Spiroplasma cells, whereas all other hemolymph samples contain both Spiroplasma cells and hemolymph. Flies-harboring Spiroplasma have significantly higher total levels of protein and sterol in the hemolymph. Mean ± SEM of three independent experiments is shown, *p=0.04 and *p=0.037. After centrifugation to remove bacteria from the hemolymph, there was no longer any significant difference in protein and sterol concentrations between Spiroplasma-infected and uninfected hemolymph. Mean ± SEM of three independent experiments is shown, NS (p=0.881 and p=0.491, respectively). (F) Quantification of DAG content of hemolymph extracts from flies that harbor Spiroplasma (Sp (+)) and flies that do not (Sp (−)). *p=0.0266. Mean ± SEM of three independent experiments is shown. (G) Quantification of whole-fly (reflecting mainly fat body) TAG levels in flies that harbor Spiroplasma (Sp (+)) and uninfected flies (Sp (−)). **p=0.0043. Mean ± SEM of three independent experiments is shown. (H) Survival of flies subjected to an acute starvation after being maintained on rich media for 12 days. Flies-harboring Spiroplasma (Sp (+)) have significantly greater mortality rate than flies that do not harbor Spiroplasma (Sp (−)). ***p<0.0001. N = 20 flies per condition, shown is one representative experiment out of three independent. Since the hemolymph derived from Spiroplasma-infected flies contained Spiroplasma and had reduced DAG, it is likely that Spiroplasma is not directly incorporating DAG into their membrane but rather metabolize DAG into another compound. The main classes of lipids that are present in Spiroplasma are phosphatidylglycerols, sterols, sphingolipids, and cardiolipins (Freeman et al., 1976). Cardiolipins are a class of lipids found exclusively in eubacteria and in the mitochondria of eukaryotic cells (Hawthorne and Ansell, 1982). In contrast to other major lipidic components of Spiroplasma membranes, cardiolipins are not present at detectable levels in the Drosophila hemolymph (Carvalho et al., 2012). Cardiolipins are comprised of four acyl chains, two phosphate groups and three glycerols, and therefore are made up of similar components to DAGs, which consist of two acyl chains and a glycerol. Analysis of the Spiroplasma genome reveals that Spiroplasma is nearly devoid of lipid metabolic capacities but possess genes involved in the synthesis of cardiolipin from the precursor DAG through a pathway involving DAG-3-phosphate and cytidine diphosphate-DAG (unpublished data). To investigate the production of cardiolipin by Spiroplasma, we conducted a MALDI time-of-flight mass spectrometry (MALDI-Tof-MS) analysis of lipid species in fly hemolymph and found that there were only peaks at m/z values that correspond to cardiolipin in the hemolymph of flies-harboring Spiroplasma (Figure 6A). A major ion at m/z 1425.05 was isolated and fragmented, which confirmed the presence of cardiolipin and revealed that the cardiolipins were comprised of C16:0 and C18:1 acyl chains (Figure 6B). In addition, we used liquid chromatography–tandem mass spectrometry (LC-MS/MS) to quantify the effect of Spiroplasma infection on the concentration of individual DAG species in Drosophila hemolymph. We observed that overall DAG concentration declined by 16.3%, however certain DAG species (e.g., C32:1 and C34:1 DAG) declined to a much greater extent (Table 1). It is notable that DAG species that decline to the greatest extent in the presence of Spiroplasma are those likely to contain (based on Drosophila fatty acid composition) one saturated (e.g., C14:0 or C16:0) and one mono-unsaturated (e.g., C16:1 or C18:1) medium-length acyl chain (Shen et al., 2010). The observation that Spiroplasma-generated cardiolipin contains the same configuration of one saturated and one mono-unsaturated medium-length acyl chain (predominately C16:0, C18:1) indicates that Spiroplasma most likely produce cardiolipin using fly hemolymph DAG. The transformation of DAG into cardiolipin offers an explanation for the observed decrease in hemolymph DAG levels in the presence of Spiroplasma. Spiroplasma produces cardiolipin in Drosophila hemolymph. (A) Negative MALDI-TOF/MS lipid profile of hemolymph from Spiroplasma-uninfected (top) and Spiroplasma-infected flies (bottom). The m/z signal peaks in the 1380–1460 range of Spiroplasma-uninfected hemolymph do not correspond to m/z values of cardiolipin, whereas the peaks in this region for Spiroplasma-infected hemolymph profile (e.g., 1403.11, 1425.05) do correspond to cardiolipin. 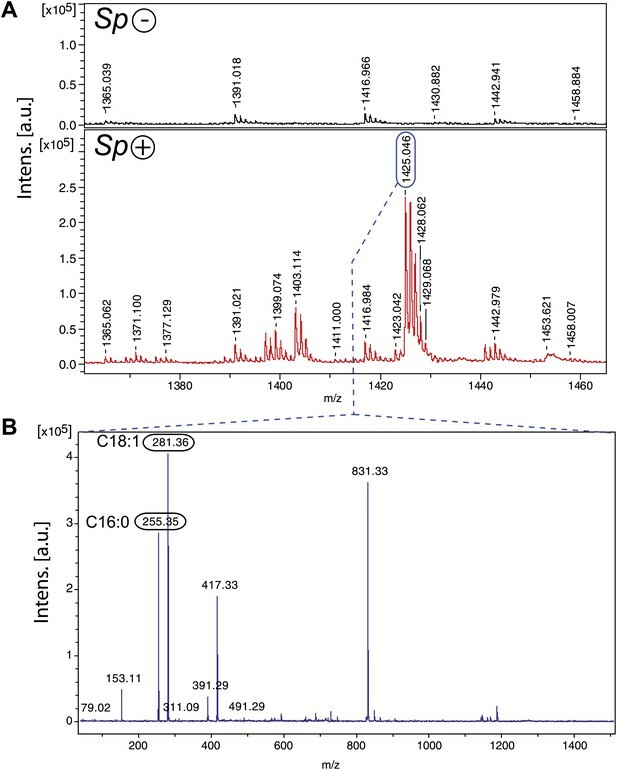 (B) The isolation and fragmentation of the m/z 1425.05 parent ion resulted in the generation of daughter ions with peaks at m/z 281.36 and 255.35 that have been characterized as oleic acid (C18:1) and palmitic acid (C16:0) using Lipid MS Predict software with an error tolerance set to 0.1 u.m.a. The peak at m/z 79.02 detected in the same experiment corresponds to a phosphate ion. Six additional peaks (m/z 153.11, 311.09, 391.29, 417.33, 491.29 and 831.33) were also detected corresponding to phosphatidyl moieties and the cardiolipin ‘backbone’ (Hsu and Turk, 2006). Altogether, this indicates that the molecular ion corresponds to the cardiolipid species [M-2H+Na]− m/z 1425.05. Quantification of the absolute concentration of individual DAG species in the hemolymph of Spiroplasma-uninfected (Sp (−)) and Spiroplasma-infected (Sp (+)) mated flies by LC-MS/MS. The % of total mass decline reflects the percentage of the total decline between Spiroplasma-uninfected and infected samples (a total of 15.1 μg/ml or 16.3%) that can be attributed to each DAG species. It is notable that C32:1 and C34:1 DAG species decline to a greater extent than other common DAG species such as C28:0 and C32:2. This suggests that Spiroplasma is preferentially incorporating DAGs that have one saturated and one mono-unsaturated acyl chain. Notably, C34:1 DAGs are likely to be made up of oleic (C18:1) and palmitic (C16:0) acids, which have exactly the same acyl chains that were identified in Spiroplasma-generated cardiolipins (Figure 6B). In Drosophila, dietary lipids are broken down in the gut lumen by lipases prior to absorption by intestinal cells (Sieber and Thummel, 2012). In the enterocytes, these compounds are used for the synthesis of DAG, which is packaged together with phosphoethanolamine, sterol, other minor lipids, and the apolipophorin protein (Lpp), to form lipoprotein particles. Lpp is produced in the fat body but travels to the gut where it gets loaded with lipids prior to trafficking throughout the body (Palm et al., 2012). Lpp is the main hemolymph lipid carrier, since more than 95% of the hemolymph lipids in Drosophila co-fractionate with Lpp (Palm et al., 2012). Our results are consistent with Spiroplasma subverting and utilizing the lipids contained in hemolymph lipoprotein particles prior to their arrival at the fat body. This has the consequence of decreasing the observed levels of stored lipids. To rule out the possibility that Spiroplasma induces the mobilization of lipid stores, which could also decrease TAG levels, we quantified the effect of Spiroplasma on TAG levels in AKHR and Bmm double mutant flies. Adipokinetic hormone receptor (AKHR) and the Brummer lipase (Bmm) are components of two independent pathways that mobilize lipids from Drosophila fat bodies. Signaling through AKHR initiates mobilization of stored lipid in the insect fat body (Gäde and Auerswald, 2003), and Bmm is a TAG lipase involved in mobilization of stored lipid (Grönke et al., 2005). AKHR1;bmm1 double mutant flies exhibit an ‘obese’ phenotype because the fat bodies of these flies store lipids but are not subsequently able to mobilize or release lipids (Grönke et al., 2007). We found that fat body TAG levels in AKHR1;bmm1 double mutants that harbored Spiroplasma were still significantly lower after 12 days than flies with the same genotype that did not harbor Spiroplasma (Figure 7). While we cannot rule out other, as of yet uncharacterized, lipid mobilization pathways that could theoretically be activated by Spiroplasma, these results are still a strong indication that Spiroplasma lipid acquisition most likely occurs in the hemolymph before the point of lipid entry into the fat body stores. Spiroplasma-induced lipid depletion is not caused by the mobilization of stored lipids. TAG levels in AKHR1;Bmm1 double mutants that harbor Spiroplasma (AKHR1;Bmm1 Sp (+)) relative to the same genotype without Spiroplasma (AKHR1;Bmm1 Sp (−)). *p<0.0153. Flies were maintained on a rich Drosophila diet for 12 days prior to TAG analysis. Mean ± SEM of three independent experiments is shown. We have observed that: (i) Spiroplasma's proliferation is affected by host nutrient limitation and (ii) Spiroplasma consumes the hemolymph DAGs. These findings lead us to hypothesize that the proliferation of Spiroplasma could be constrained by the availability of lipids in the hemolymph, which is known to be heavily dependent on the insect nutritional status (Canavoso et al., 2001). To further investigate the lipid-centric metabolic interplay between Spiroplasma and Drosophila, we monitored Spiroplasma proliferation in flies with a reduced capacity for inter-organ lipid transport and hence decreased hemolymph lipid concentrations. A recent study has shown that RNAi-mediated knockdown of Lpp in the fat body resulted in a decrease in circulating lipoprotein particles and a blockage of lipid export from the gut of Drosophila larvae (Palm et al., 2012). Based on these findings, we used a similar RNAi strategy to knockdown Lpp in the fat body of adult flies. In this experiment, we specifically expressed Lpp-RNAi in the fat bodies of adult flies using a flippase-mediated activation strategy (Marois and Eaton, 2007). We established that RNAi-mediated knockdown of Lpp does not significantly decrease the overall levels of protein in the adult hemolymph (Figure 8—figure supplement 1) but does decrease adult hemolymph-lipids, as shown by quantification of hemolymph DAG and sterol (Figure 8A,B). We then investigated the effect of this lipid reduction on the Drosophila–Spiroplasma interaction. We found that under conditions of Lpp knockdown, Spiroplasma proliferation was severely inhibited resulting in lower Spiroplasma titers in flies after 14, 21, and 28 days of aging (Figure 8C). To rule out any possibility that the genetic background of Lpp-RNAi flies was causing the observed decrease in Spiroplasma titers, we quantified Spiroplasma titers in the absence of activation of Lpp-RNAi by heat-shock and found no significant difference between flies containing the Lpp-RNAi construct and those that did not (Figure 8—figure supplement 2A). In addition, we used an independent Lpp-RNAi construct with another fat body specific driver and activation strategy to confirm that the decrease in Spiroplasma titers was specifically caused by RNAi-mediated Lpp knockdown (Figure 8—figure supplement 2B). It is noteworthy that Spiroplasmas are not known to have the capacity to utilize proteins as nutrient sources (Chang and Chen, 1983), supporting the claim that lipids carried by Lpp (and not the Lpp protein itself) are the factors required for the proliferation of Spiroplasma. Another striking effect of the RNAi-mediated knockdown of Lpp was strongly diminished Spiroplasma-induced old age mortality (Figure 8D). Lpp-lipids are required for Spiroplasma proliferation. (A) Quantification of DAG levels in hemolymph of 12-day-old flies 8 days after knockdown of Lpp by RNAi. Mean ± SEM of three independent experiments is shown, *p=0.015. (B) Quantification of sterol concentration in hemolymph of 12-day-old flies 8 days after knockdown of Lpp by RNAi. *p=0.0125. Mean ± SEM of three independent experiments is shown. (C) Spiroplasma titers quantified by qPCR in flies which have Lpp expression knocked down by RNAi relative to control flies. Spiroplasma titers were quantified at 7, 14, 21, and 28 days after activation of RNAi. Mean ± SEM of at least three samples is shown (five flies pooled per sample). ***p=0.0005 (14 days), *p<0.01 (21 days), and *p<0.01 (28 days). Shown is one representative experiment out of three independent experiments. (D) The survival of Spiroplasma-infected (Sp (+)) and Spiroplasma-uninfected (Sp (−)) flies with or without RNAi-mediated Lpp knocked down. ***p<0.0001, N = 18 flies per condition. Shown is one representative experiment out of three independent experiments. We have demonstrated that Spiroplasma subverts specific host lipids and that its proliferation is limited by the availability of host hemolymph-lipids. This finding is based on several observations: (i) Spiroplasma proliferation rate is decreased in the hemolymph of nutrient deprived flies and old flies, two conditions in which hemolymph–lipid concentration is decreased; (ii) the proliferation of Spiroplasma depletes hemolymph and fat body lipids; and (iii) a genetically induced reduction in Lpp-lipids inhibits Spiroplasma proliferation. Natural selection is expected to favor vertically transmitted endosymbionts with adaptations that minimize fitness costs to their hosts (Werren and O'Neill, 1997). We hypothesize that Spiroplasma's dependence on hemolymph-lipid availability for proliferation could be of adaptive significance, since it would enable Spiroplasma to limit its proliferation in the face of host nutrient deprivation, and therefore avoid the costly depletion of its host's energy and other vital metabolites. If the proliferation rate of Spiroplasma were to be determined by metabolites that do not decline under nutrient-limiting conditions, for example sugars and L-amino acids, then Spiroplasma proliferation would not be limited under host nutritional deprivation. Such a lack of restriction could result in greater negative effects on its host's fitness. For example, we might expect a striking decrease in reproductive output or survival, which was not observed for Spiroplasma-infected flies maintained on a nutrient poor diet. We only observed that mated flies-harboring Spiroplasma had increased mortality after about 7 days under nutrient-limiting conditions, and this is not likely to have a major impact on host fitness since increased mortality occurred after the production of eggs had stopped. Under normal conditions, Spiroplasma's significantly decreases the life span of its host Drosophila (also shown in Ebbert, 1991). However, aspects of this Spiroplasma-induced pathogenesis, including the late onset of symptoms, suggest that Spiroplasma may be employing strategies to minimize host fitness costs. Spiroplasma's capacity to utilize available host lipids for proliferation results in depleted hemolymph-lipids and reduced fat body stores. This depletion also has a fitness consequence for flies, since Spiroplasma-infected flies die more rapidly when subjected to a period of acute starvation, but it is possible that Spiroplasma's reliance on these lipids might be less detrimental than usage of other more critical metabolites that would impact host fitness more directly. Drosophila fitness and longevity are linked to egg production rates (Partridge et al., 1987), which can be affected by the presence of facultative endosymbionts (Fast et al., 2011). On nutrient rich media, we found that despite increasing early egg production Spiroplasma infection status did not affect the total number of eggs laid over a 14-day period. The Spiroplasma-induced early increase in egg production has been described previously for other Spiroplasma strains (Ebbert, 1991; Martins et al., 2010). While the mechanistic basis of this increase is unknown, it offers a possible explanation for the greater number of eggs laid by Spiroplasma-infected flies on nutrient poor media, where the majority of eggs laid by all flies are in the first 2 days post-eclosion. Under rich nutritive conditions, we observed that Spiroplasma increased by twofold the number of eggs laid by virgin flies over a 14-day period. This finding is suggestive of a Spiroplasma-mediated disruption in the balance between egg retention and laying of virgin flies. One could speculate that Spiroplasma interferes with the signaling pathways (e.g., Juvenile Hormone and/or Ecdysone), which have previously been shown to regulate the production of eggs (Soller et al., 1999). We observed a decrease in Spiroplasma proliferation in flies after 28 days. A late decline in Spiroplasma proliferation has been demonstrated for a number of other Spiroplasma strains (Anbutsu and Fukatsu, 2003; Haselkorn et al., 2013). It is notable that flies aged for 28 days also experience a decline in DAG concentration, which is likely to explain the declining Spiroplasma proliferation rate. We suspect that Spiroplasma proliferation over the life of flies results in elevated Spiroplasma titers that ultimately deplete host hemolymph lipid and constrain further proliferation. 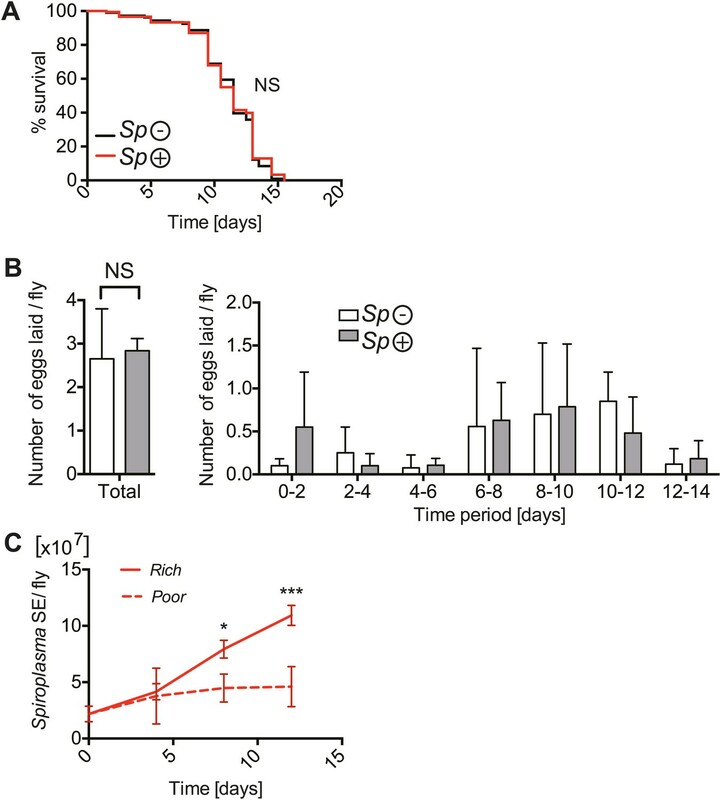 In the MSRO-Spiroplasma system, this decline in proliferation does not appear to limit Spiroplasma-induced mortality, however, other Drosophila–Spiroplasma strains appear to reach maximal titers at earlier time points and therefore this is an aspect of the endosymbiont's biology could play a more important role in limiting fitness costs in other systems. We noted that Spiroplasma-infected flies had higher levels of cardiolipin, suggesting that Spiroplasma synthesize cardiolipin, most likely using DAG acquired from host lipoproteins. We observed that Spiroplasma specifically depleted host DAG species that contained one saturated and one mono-unsaturated acyl chain, which was also the most abundant acyl chain configuration in Spiroplasma-produced cardiolipin (which contained C16:0 and C18:1 acyl chains). The basis of this acyl chain specificity is not known, but it could be linked to biophysical properties of cardiolipins in the highly curved Spiroplasma membrane. The utilization of DAG as a precursor for cardiolipin synthesis is supported by the annotation of the Spiroplasma genome (unpublished data), which enabled the identification of a biosynthetic pathway similar to that described in Mycoplasma synoviae and Mycoplasma hyopneumoniae for the synthesis of cardiolipin from acylglycerols through DAG-3-phosphate and cytidine diphosphate-DAG (Arraes et al., 2007). A number of studies have demonstrated links between cardiolipin and cell death (Gonzalvez and Gottlieb, 2007), which raise the possibility that cardiolipin produced by Spiroplasma could be involved in its pathological effects in old flies. The other lipids that comprise a smaller fraction of Lpp's cargo, including sterols and sphingolipids (Palm et al., 2012) might also be important for Spiroplasma proliferation but these lipids would most likely be incorporated unchanged into the membrane of Spiroplasma. Of the other lipid classes contained in lipoproteins, sterols are of particular interest as they have been shown to be required for proliferation of all species of Spiroplasma, and to be highly abundant in the Spiroplasma plasma membrane (Freeman et al., 1976). Amongst bacteria, this requirement for sterol is unique to mollicutes (Dahl, 1993). Since insects are auxotrophic for sterols (Canavoso et al., 2001), their concentrations are determined by dietary uptake. Although it is therefore possible that the sterol availability could play a key role in coordinating Spiroplasma proliferation with host nutritional state, we were unable to recover normal Spiroplasma proliferation rates when flies were maintained on nutrient poor media complemented with sterol (unpublished data). This finding suggests that, while sterol might be important for Spiroplasma proliferation, it is not sufficient to induce proliferation under conditions of nutrient limitation. The strategies employed in different insect endosymbioses to limit over-proliferation of endosymbionts are not well characterized. We have proposed a model in which Spiroplasma's dependence on host hemolymph-lipid availability could limit its over-proliferation, primarily in the face of host nutritional scarcity. This mechanism could be important for the controlling proliferation of diverse extracellular endosymbionts. Different mechanisms are likely to be involved in intracellular endosymbiont control. 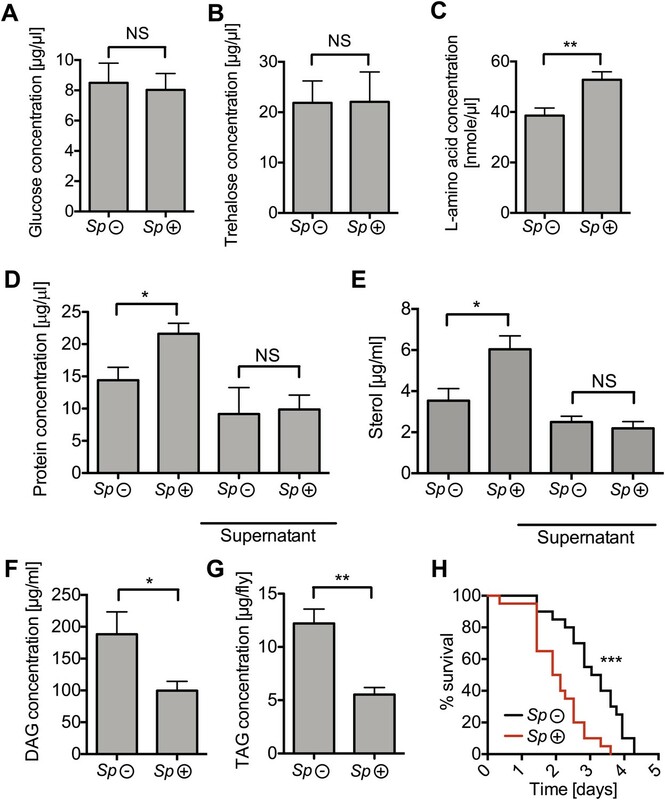 For example, proliferation and localization of the obligate Sitophilus primary endosymbiont (SPE) is controlled by the expression of a specific antimicrobial peptide from its host, Sitophilus weevils (Login et al., 2011). In aphids, studies suggest the activation of the host lysosomal system is involved in controlling titers of the obligate intracellular endosymbiont, Buchnera (Nishikori et al., 2009). The metabolic exchanges between endosymbiotic bacteria and their arthropod hosts are generally not well understood, partly due to challenges associated with high levels of integration and interdependence between partners. Most of the available information is indirect, coming from the study of endosymbiont genomes, which reveals limited metabolic capacities and high levels of dependence on hosts (Zientz et al., 2004; Gosalbes et al., 2010). There are a number of studies that examined metabolic exchanges between hosts and obligate endosymbionts, which provide their hosts with one or more vital metabolite that is missing from the host's diet (Douglas, 1998; Russell et al., 2013). These studies usually consider metabolic transfers from endosymbiont to host and not in the reverse direction (Dale and Moran, 2006). We have identified a transfer of metabolites from host to endosymbiont, showing that Drosophila Lpp-lipids are used by Spiroplasma for proliferation and more specifically provide evidence indicating that host-derived DAG is converted to cardiolipin by Spiroplasma. A number of recent studies have revealed that facultative endosymbionts protect their hosts from parasites and pathogens (Oliver et al., 2003; Hedges et al., 2008; Teixeira et al., 2008). Endosymbiotic Spiroplasma has been implicated in a number of cases, including protecting diverse hosts from various eukaryotic parasites including parasitoid wasps, parasitic nematodes, and fungi (Jaenike et al., 2010; Xie et al., 2010; Łukasik et al., 2012). We speculate that Spiroplasma-mediated protection could be linked to lipid utilization. Indeed, many parasitoid wasps are unable to synthesize fatty acids and their development requires the acquisition of host lipids (Visser et al., 2010). Thus, sequestration of lipid by Spiroplasma might limit availability to any parasites or pathogens that occupy the same niche. Here, we have shown that the rate of Spiroplasma proliferation and onset of fly mortality are decreased upon depletion of hemolymph lipids. It is noteworthy that a variety of other microorganisms known to proliferate in Drosophila hemolymph and to cause pathogenesis such as Erwinia carotovora strain 15, Listeria monocytogenes, Candida albicans, and Enterococcus fecalis do not appear to have attenuated virulence when hemolymph lipids are depleted (unpublished data). Many of these pathogens are free-living and are likely to have retained well-developed metabolic capacities (including the capacity to synthesize lipids). It is interesting to speculate that increased reliance on host provision of lipids is part of a suite of adaptations that facilitate the evolution of chronic, low-virulence infection strategies. It is notable that a number of pathogens that have the capacity to form chronic infections in humans including Mycobacterium tuberculosis and Chlamydia trachomatis have been shown to be heavily dependent on lipids acquired from their hosts (Ehrt and Schnappinger, 2007; Robertson et al., 2009). Thus, the findings discussed here for endosymbionts could be of more general importance for host–microbe interactions. We used a wild-type Oregon-R (ORR) fly stock that harbors MSRO Spiroplasma (Pool et al., 2006; Herren and Lemaitre, 2011) but not Wolbachia. The w;AKHR1;bmm1 stocks used have been described (Grönke et al., 2007). RNAi-mediated knockdown of Lpp was achieved using a pFRiPE-mediated inducible RNAi element (Marois and Eaton, 2007), placed in the presence of a heat-shock inducible flippase and an Adh-GAL-4 driver that is mostly active in the fat body. The strategy and stocks used are analogous to a previously published study, except that we induced RNAi in adults, as opposed to larvae (Palm et al., 2012). We induced the flippase by heat-shock (1.5 hr at 37°C in a water bath) in 4- to 5-day-old adult flies. This results in the excision of an upstream spacer region and activation of the UAS-Lpp-RNAi construct driven by Adh-GAL-4 and the silencing of Lpp in the fat body, specifically at the adult stage. An additional strategy used to knockdown the expression of Lpp involved the C564-GAL-4 driver (also mostly active in the fat body) in conjunction with tubulin-gal80ts, a temperature-sensitive repressor of GAL-4 expression, which blocks GAL-4 expression at 18°C but not 29°C (McGuire et al., 2003). Flies that contained both the C564-GAL-4, tubulin-gal80ts, and UAS-Lpp-RNAi(46) elements were maintained at 18°C and then shifted to 29°C as adults to induce UAS-Lpp-RNAi(46) and knockdown Lpp expression. The UAS-Lpp-RNAi(46) stock is TRiP #HM05157 originating from the transgenic RNAi project at the Harvard Medical School. Since Spiroplasma MSRO is vertically transmitted and kills male embryos, Spiroplasma-infected stocks were generated in several steps: (1) Crossing an infected ORR female with males carrying appropriate balancer chromosomes (2) Crossing the balanced female progeny with males of the genotype of interest (either w;AKHR;Bmm, w,HS-FLP;adh-GAL-4/bcg or Dipt-GFP,C564-GAL-4;tub-GAL80ts) (3) Several back-crosses were then carried out, resulting in a homozygous Spiroplasma-infected female with the appropriate genotype. These stocks were then maintained by crossing females with non-infected males of the same genotype. Spiroplasma-infected females carrying a GAL-4 construct were then crossed with males carrying UAS-RNAi constructs or controls (w background). All flies were maintained at 25°C unless otherwise specified. The density of animals per vial was equilibrated between Spiroplasma-infected and Spiroplasma-uninfected stocks for development under similar levels of larval competition. Unless otherwise specified, all flies used were females and virgins. For survival experiments, counts were made every 24 hr and flies were transferred to new tubes every 3–4 days (2 days for mated flies). Climbing assays were carried out as described (Barone and Bohmann, 2013). Acute starvation assays have been described previously (Grönke et al., 2007). To quantify the number of eggs laid, flies were collected immediately post-eclosion and maintained in individual Drosophila vials that each contained five flies. Eggs were counted every 48 hr over a 14-day period, and the number of eggs laid per 48 hr per fly was calculated (correcting for any fly mortality). For experiments that required mated flies, males (three for every five females) were placed in the Drosophila vials and then removed after 7 days, males that died prior to this were replaced. Flies were raised and maintained on a standard cornmeal-agar diet, referred to as ‘rich media’. Normal media contain 4.5 g agar, 58.8 g inactivated yeast (Springaline BA95/0; Biospringer, Milwaukee, WI, USA), 35 g maize flour (Farigel Maize; Westhove, Ennezat, France), 34.8 ml of 1:1 mix of grape and multi-fruit juice (approximately 8.2 g of sugar), 3.6 ml of propionic acid, and 18 ml of a 10% solution of methyl paraben in 85% ethanol per 600 ml of water. For nutrient deprivation, adults were maintained on a restrictive diet referred to as ‘poor media’, which contains 9 g agar, 1.9 g inactivated yeast, 7.5 g maize flour, 4.5 g sucrose, 9 g glucose, 0.3 g MgSO4, 0.3 g CaCl2, 3.6 ml propionic acid, and 18 ml of a 10% solution of methyl paraben in 85% ethanol per 600 ml of water (Vijendravarma et al., 2012). Poor media complemented with inactivated yeast contain an additional 34 g of inactivated yeast. Poor media complemented with sucrose contain an additional 35.5 g of sucrose. In all cases, larvae were raised on rich media. To observe Spiroplasma in fly hemolymph, flies were dissected on microscope slides in 5 μl PBS containing 0.02 mM SYTO9 (Invitrogen, Carlsbad, CA, USA). Slides were then mounted and observed on an Axioimager Z1 (Zeiss, Oberkochen, Germany). Images were captured with an Axiocam MRn camera and Axiovision software. We extracted DNA from five flies per sample. The DNA extraction and quantitative PCR protocols have been previously described (Anbutsu and Fukatsu, 2003; Herren and Lemaitre, 2011). To determine the absolute number of bacteria per extraction, we extracted infected fly hemolymph and used fluorescence microscopy to calculate the concentration of Spiroplasma cells stained using SYTO9 (as described above). A dilution series of known concentrations of Spiroplasma cell equivalents (SE) was then combined with five uninfected flies prior to DNA extraction and qPCR, which enabled us to generate a calibration curve. In subsequent analyses, to account for differences between qPCR runs, we always used a positive control of known Spiroplasma concentration. The results for all experiments involving Spiroplasma titers are given in SE per fly, which represents the absolute quantities of Spiroplasma per fly. A host gene, RPS17, was also always quantified to verify the quality of the extraction but did not use this value in the analyses. To quantify bacteria in hemolymph samples, 0.5 μl of hemolymph (collected as described for metabolite analyses) was diluted in 300 μl cell lysis buffer prior to DNA extraction and qPCRs as previously described (Herren and Lemaitre, 2011). Drosophila hemolymph was collected from flies individually using a Drummond nanoject and pulled capillary needle. Metabolic quantifications are given as the mass (µg) of metabolite per µl or ml of Drosophila hemolymph. For each hemolymph sample, we collected 2 µl (∼25 flies), which was then diluted in 100 µl H2O prior to subsequent analyses. For all analyses hemolymph samples were centrifuged at 13,000×g for 2 min to remove Drosophila cells. Protein concentration was determined using a Bradford assay (Bio-Rad, Hercules, CA). Glucose and trehalose concentration was quantified using glucose HK kit (Sigma-Aldrich, St. Louis, MO, USA). Samples were treated with or without trehalase (11 mU, Sigma-Aldrich) overnight at 37°C, and trehalose levels were obtained by subtracting the amount of free glucose in the untreated sample from the total glucose present in the sample treated with trehalase. L-amino acid concentration was quantified by a coupled enzyme reaction, using the L-amino acid quantitation kit (Sigma-Aldrich). Hemolymph DAG and fat body TAG were analyzed using a coupled colorimetric assay (Hildebrandt et al., 2011). Sterols were quantified using the Amplex Red Cholesterol Assay kit (ThermoFisher Scientific, Waltham, MA, USA), which detects primarily cholesterol but also other sterols found in Drosophila (e.g., ergosterol). For protein and sterol assays, Spiroplasma were removed from hemolymph samples by centrifugation at 15,000×g for 15 min. For whole fly analyses, 10 flies were homogenized in 250 μl PBS and the quantifications are given per fly. Note that there was no significant difference in the mass of virgin flies with and without Spiroplasma at 7 and 14 days of age (unpublished data). There was also no significant difference in the feeding rate of virgin flies with and without Spiroplasma (unpublished data) as measured by CAFE assay (Ja et al., 2007) over a period of 4 hr at 3, 10, and 12 days of age. Drosophila hemolymph (collected as described for metabolite analyses) was diluted in 1:10 in H2O. Lipids were extracted using a mixture of chloroform/methanol (50/50 vol:vol). After mixing and centrifugation, 1 μl of the lipid extract was diluted with 1 μl of 9-aminoacridine matrix (25 mg/ml, dissolved in isopropanol/acetonitrile [3/2, vol/vol]). For MALDI-Tof-MS analysis, 1 μl of the mixture was rapidly spotted on an MTP 384 polished steel MALDI plate (Bruker Daltonics, Billerica, MA, USA). MALDI-Tof mass spectra of the Drosophila hemolymph samples were acquired using FlexControl 3.0 (Bruker Daltonics) on a Bruker AutoFlex III Smartbeam (Bruker Daltonics) in a negative reflectron mode at a laser beam attenuation of 50 and focus of 40 at 100 Hz as laser repetition rate. A total of 1000 shots were acquired in the mass range of 400 to 2000 m/z. Data were processed with FlexAnalysis 3.0 (Bruker Daltonics). Calibration of the instrument was performed using Peptide Standard Calibration II (Bruker Daltonics). 1000 ion counts were accumulated in the mass spectrometer prior to fragmentation. Fragmentation was performed with the Bruker designed method and at a laser beam attenuation of 42%, a laser repetition rate of 100 Hz and a reflector detector voltage set to 1.861 kV in a negative mode. Hemolymph was extracted from 1250 7-day-old adult Spiroplasma-infected and Spiroplasma-uninfected mated female flies by pricking flies in the abdomen and thorax before centrifugation of flies at 16000×g at 4°C for 30 min in a 10-μm filter spin column (Mobitec, Goettingen, Germany). Hemolymph was subsequently filtered in Ultrafree-MC Centrifugal Filter Units (0.22 µm pores) at 16000×g at 4°C for 10 min. These samples were then sent to Avanti Polar Lipids analytical services division (http://www.avantilipids.com) where lipids were extracted (Folch et al., 1957) prior to extracts being spiked with internal standards for LC-MS/MS quantification of diacylglygerol species concentrations (Hutchins et al., 2008). Statistical significance was calculated using a Gehan-Breslow-Wilcoxon test for survivals and an unpaired Student's t test for all other experiments (with GraphPad Prism 5.0) and considered significant if p-values were lower than 0.05. Asterisks indicate the level of significance: *p<0.05, **p<0.01, and ***p<0.001 and NS (non-significant). Journal of Cell Science 122:4570–4583. Applied and Environmental Microbiology 69:1428–1434. Genetics and Molecular Biology 30:182–189. Journal of Visualized Experiments 74:e50339. Annual Review of Nutrition 21:23–46. Insect Biochemistry and Molecular Biology 29:153–160. Annual Review of Entomology 43:17–37. Journal of Biological Chemistry 226:497–509. General and Comparative Endocrinology 132:10–20. International Journal of Medical Microbiology 300:271–278. In: RF Whitcomb, JG Tully, editors. The Mycoplasmas. New York: Academic Press. pp. 113–200. Journal of the American Society for Mass Spectrometry 17:420–429. The Journal of Lipid Research 49:804–813. Proceedings of the National Academy of Sciences of USA 104:8253–8256. Methods in Molecular Biology 397:115–128. Spiroplasma infection in Drosophila melanogaster: what is the advantage of killing males? Journal of Invertebrate Pathology 105:145–150. Proceedings of the National Academy of Sciences of USA 94:10792–10796. Journal of Insect Physiology 55:351–357. Proceedings of the National Academy of Sciences of USA 100:1803–1807. Journal of Insect Physiology 33:745–749. Applied and Environmental Microbiology 79:6117–6123. The Journal of Lipid Research 51:2985–2992. Proceedings of the Royal Society B: Biological Sciences 276:2805–2811. Proceedings of the Royal Society B: Biological Sciences 279:3540–3546. Proceedings of the National Academy of Sciences of USA 107:8677–8682. Influential passengers: inherited microorganisms and arthropod reproduction, Oxford, Oxford University Press. Microbiology and Molecular Biology Reviews 68:745–770. Thank you for sending your work entitled “Regulation of Insect Endosymbiont Proliferation by Lipid Availability” for consideration at eLife. Your article has been evaluated by Richard Losick (Senior editor), a Reviewing editor, and 3 reviewers. The Reviewing editor and the other reviewers discussed their comments before we reached the decision that some major revisions are needed before this manuscript is accepted for publication. The Reviewing editor has assembled the following comments to help you prepare a revised submission. Although the experiments have been done well and the reviewers are largely satisfied with the quality of data, every reviewer is concerned with the interpretations and the underlying model presented in this paper. Each reviewer pointed out that there is no evidence presented for an adaptive mechanism and the results can easily be explained as representing a control of bacterial growth depending upon the limitations of lipid supply provided by the fly. In the revised version, please make sure that this discussion is reversed in the abstract and the main article. It may be OK to provide a clearly stated speculation at the end, but the idea that the data point to fitness needs to be modified. Please do take this suggestion seriously as the reviewers were quite unconvinced by the arguments. 1) The authors interpret their results in terms of a parasite strategy to limits its own titer to preserve the fitness of the flies: “... Spiroplasma proliferation is optimized to minimize fitness costs to the host under conditions of nutrient limitation.” None of the reviewers agree with this conclusion. In fact, the reviewers all agree that this likely happens for any internal parasite uniquely dependent on its host for growth. Also, the reviewers do not agree with the title of the manuscript as it offers no proof of regulation. One way to address the question would be to manipulate the parasite, something that is not feasible at present. One reviewer suggested that the authors could use Spiroplasma citri, a parasite that supposedly cannot control its own growth. The authors may wish to consider this suggestion, but it may be simpler to reword the title and manuscript. 2) Is there a control mechanism? Titers continuously increase with age of flies as shown in Figure 1 – up to the last day sampled (day 28) in flies on rich diets. If symbionts become ever denser until the fly dies at an old age, it's hard to argue that titer is adaptively regulated to optimize a tradeoff between host fitness and symbiont transmission (as hypothesized). It would appear instead that they start at a low titer and are expanding as the fly ages but never reaching their “limit” imposed by the DAG levels. Or maybe the point is that such a limit is only imposed on poor diets. On these, it does appear that the titers level off. Since intracellular bacteria can have very long doubling times, maybe these are only starting to reach their limit after 21 days. 3) The experiments show that a limit is imposed when DAG is low. But would a higher titer be reached when DAG is increased above that achieved by normal flies on rich diet? 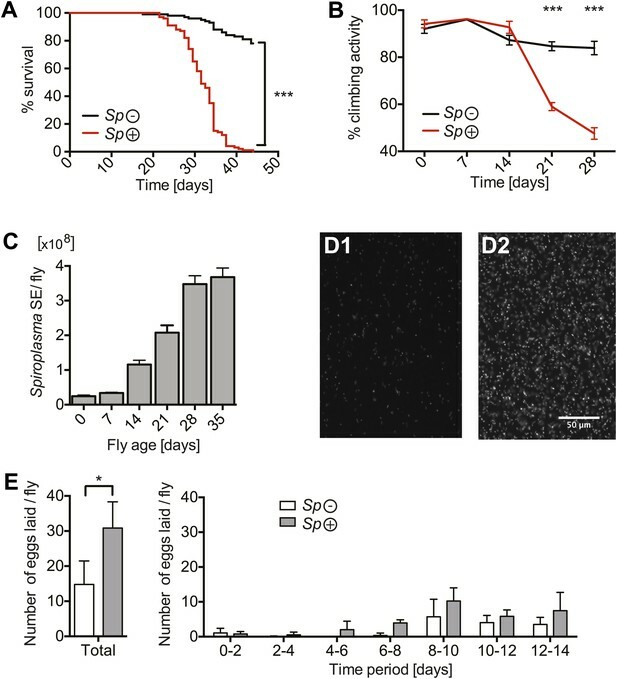 If DAG could be experimentally elevated without altering fly diet, it would be interesting to see whether the symbionts increase faster across the lifespan. Even if that cannot be tested, it is still meaningful that on poor diets, DAG contributes to controlling numbers. The arguments about the adaptiveness of using DAG rather than glucose or trehalose make sense, but are not really proof of an adaptive control. Maybe Spiroplasma is limited by lipids and reaches ecological carrying capacity, and this happens to be at a titer that does not kill the fly but may still not be optimal for the “trade-off”. The paper is claiming this mechanism that has evolved to achieve some optimal level of proliferation (e.g., in the Abstract) but maybe has only shown that Spiroplasma is limited by lipids. 4) The experiments claiming that poor diet reduces bacterial growth and pathogenesis are over interpreted, at best. The diet is so poor that these flies live a max of 15 days, with mortality starting at day 2 or 3. So, this diet is basically lethal and it is unclear is much can be learned from this assay. The authors should consider removing this part from the paper or provide alternative conditions. The connection between DAG to cardiolipin is not developed and needs better clarification and explanations. 5) The choice of performing this study on virgins is not discussed and justified in any manner. As egg production requires the bulk of lipids, one wonders what happens to egg production in mated females under nutrient-poor conditions and how the parasite is able to optimize its transmission under these adverse conditions. What happens then to oogenesis and parasite transmission? If there are not enough lipids around to sustain oogenesis, will the parasite titer remain low so as to benefit should conditions ultimately improve? Clearly, it would be essential to monitor egg production as well as parasite transmission under these nutrient-poor conditions (which might be actually too harsh given the premature death of flies; flies given only a sucrose diet live much longer), and not just parasite titer and host longevity. Of note, even virgin females do lay eggs after a few days. These represent also a loss of lipids. What happens under normal conditions: is there a difference in egg production between infected and non-infected flies? Are the virgin flies still laying eggs under nutrient-poor conditions? We agree with the statement our results can “be explained as representing a control of bacterial growth depending upon the limitations of lipid supply by the fly”, and do not fully understand the contradiction between this statement and our suggestion of an adaptive regulatory mechanism. However, we are in agreement that we do not provide evidence for an adaptive mechanism (this work was more focused on molecular and metabolic interactions and less on evolutionary interactions). We have now removed any discussion of a lipid-dependence based adaptation from the main text and Abstract. In the conclusion we speculate that the mechanisms uncovered could have an adaptive function. We strived to use wording that emphasizes that this remains a speculation, e.g. “We hypothesize that Spiroplasma’s dependence on hemolymph lipid availability could be of adaptive significance”. We believe our results are consistent with a “parasite strategy to preserve the fitness of the flies” but as highlighted above we have not proven this. We agree with the reviewers’ opinions regarding this matter and have made significant changes to the manuscript that reflect this. For example, we no longer use the term ‘regulation’, instead suggesting that lipid availability ‘limits’ the proliferation of Spiroplasma. The title of the manuscript has been changed from “Regulation of Insect Endosymbiont Proliferation by 2 Lipid Availability” to “Insect Endosymbiont Proliferation is limited by Lipid Availability”. We are not in complete agreement with the notion that “this likely happens for any internal parasite uniquely dependent on its host for growth”. We would suggest that internal parasites can differ in their metabolic capacities and those that are able to make lipids from other diverse (and potentially more abundant) host metabolites would be expected to have a proliferation rate that is less specifically coupled to the composition of host hemolymph. In conclusion, we do agree that at some level the proliferation of an internal parasite will be limited by availability of host nutrients, but that this level differs between parasites (based on their needs/metabolic capacities) and this difference can have important implications. We have now provided a closer investigation into the late-timepoint interactions between Spiroplasma proliferation and hemolymph DAG levels. We do indeed find that Spiroplasma titers reach a limit in old flies (Figure 1C). We also found very low levels of DAG in these older flies (Figure 5–figure supplement 1) and therefore our data is consistent with a DAG mediated limitation of Spiroplasma proliferation in old flies. As such, we have identified a second condition where reduced Spiroplasma proliferation coincides with reduced hemolymph DAG. We note that this late reduction of Spiroplasma proliferation does not appear to be a very effective control strategy, since there is high mortality of flies over this period. The MSRO strain of Spiroplasma used in this study achieves titers higher than most all other Drosophila endosymbiotic Spiroplasmas (Haselkorn et. al., 2013) and therefore we suggest that old age regulation might be “too little too late” in this case, but could play a more important role for some other Spiroplasma strains. As a side note we are aware that the high mortality has the potential to bias the results for the late (35 day) timepoint analysis of Spiroplasma titers in Figure 1C. For the 35 day timepoint, we did however specifically separate flies that appeared to be very close to dying and those that were in an apparently much more healthy state and there was no significant difference between the two (data not shown). Experimentally (or directly) increasing DAG levels is very challenging due to the high 3 insolubility of these molecules in aqueous solutions. We were therefore unable to find a meaningful way of increasing hemolymph DAGs. Several preliminary experiments in which DAG dissolved in ethanol were injected into flies resulted in very high levels of fly mortality. We accept the reviewers’ suggestion that the carrying capacity of Spiroplasma in the hemolymph is determined by lipid availability. We believe this is an important and interesting finding, central to this piece of work. We are in agreement that this manuscript offers no proof for adaptive control. We have done our best to identify all the parts of the manuscript that might have suggested otherwise and to modify / remove them. We think that the concept of adaptive regulation by lipid dependence is interesting and merits being mentioned as a hypothesis in the Discussion. We have taken these comments into consideration; however, we still believe that the experiments carried out on the poor diet do offer important insights. We do not agree that the poor diet is ‘basically lethal’, since it can support the entire life cycle of Drosophila (a point we have now added to the Results section.) The study that developed this diet used it to maintain Drosophila larvae for and experimental evolution study. We reason that in nature, Drosophila are exposed to a range of conditions, at one extreme nutrient deprivation (our poor diet) and at the other nutrient abundance (our rich diet), probably going between the two over their lifetime. We agree that the implications of nutrient deprivation can be complex and therefore we have been cautious not to overinterpret the findings based on these experiments. We would like to stress that the findings made under poor nutritive conditions are presented together with numerous experiments under rich conditions as support for more general picture of the metabolic interactions between Spiroplasma and Drosophila. Regarding the connection between DAG to cardiolipin, we have provided some clarifications, including a description of the molecular components of DAGs and cardiolipins in the Results section. 5) The choice of performing this study on virgins is not discussed and justified in any manner. As egg production requires the bulk of lipids, one wonders what happens to egg production in mated females under nutrient-poor conditions and how the parasite is able to optimize its transmission under these adverse conditions. What happens then to oogenesis and parasite transmission? If there are not enough lipids around to sustain oogenesis, will the parasite titer remain low so as to benefit should conditions ultimately improve? Clearly, it would be essential to monitor egg production as well as parasite transmission under these nutrient-poor conditions (which might be actually too harsh given the premature death of flies; flies given only a sucrose diet live much longer), and not just parasite titer and host longevity. Of note, even virgin females do lay eggs after a few days. These represent also a loss of lipids. What happens under normal conditions: is there a difference in egg production between infected and non-infected flies? Are the virgin flies still laying eggs under nutrient-poor conditions? The principal reason for carrying out this study on virgins is that because the Spiroplasma strain used causes male killing (and therefore all-female broods) it was more feasible to maintain Spiroplasma-infected and uninfected virgin flies under identical conditions than non-virgin flies. Firstly, to generate ‘identical’ non-virgin flies one has to control the timing/frequency of mating (since, when Spiroplasma-infected flies emerge they stay virgin, in contrast to Spiroplasma-uninfected flies which have the opportunity to mate). This requires collecting virgin flies (Spiroplasma-infected and uninfected) and then mating them with the same number of males for the same period. Secondly, also due to the effects of Spiroplasma-induced male killing, there are (about 2x) more larvae in the media of Spiroplasma-uninfected mated flies than Spiroplasma infected mated flies, larval feeding activity is likely to change the composition of the media, and therefore for comparisons between mated Spiroplasma-infected and uninfected we therefore had to put flies on new media every 2 days. We have now carried out some of the key experiments of the paper in non-virgins (survivals, DAG hemolymph quantification) and found that these also support the conclusions drawn based on experiments carried out with virgins. In the future it would be interesting to carry out such experiments with non-male killing Spiroplasmas that are native to D. melanogaster (and also in males). So far, although there are reports of non-male killing Spiroplasmas native to Drosophila melanogaster (Watts et al., 2009, PLOS ONE), they have not been successfully maintained in the lab. We have investigated egg production by mated and unmated females on rich and poor media. The important findings of this investigation are: i) that Spiroplasma increases egg laying by virgins on rich media (Figure 1E) and mated flies on nutrient poor media (Figure 2–figure supplement 1B). ii) Spiroplasma increases the early production of eggs by mated flies on rich media Figure 1-figure supplement figure 1). These Spiroplasma-mediated affects on reproduction are likely to have important consequences for fly physiology. Indeed trade-offs are known to exist between reproductive output and lifespan and this aspect of Spiroplasma-host biology should be investigated in future work. We note that these effects on egg production are probably not underlying many of the principal effects of Spiroplasma infection characterized in this paper. Notably mated flies (Spiroplasma-infected and uninfected) produced equivalent numbers of eggs over 2 weeks and yet we still observe a decrease in lifespan and hemolymph DAG in these flies in the presence of Spiroplasma (as was previously shown with virgin flies). The experiments on egg production also support our original conclusions (based on survivals) that Spiroplasma has rather minor detrimental effects (and indeed under some conditions possibly positive effects) on host fitness. Endosymbiont titers have been linked to transmission efficiency, and therefore (as suggested by the reviewer) one could speculate that the decrease in Spiroplasma titers under nutrient deprivation could have effects on Spiroplasma transmission. While interesting, investigating this under our experimental conditions was not feasible because so few eggs were laid per fly under conditions of nutrient deprivation. It is also notable that in mated flies, where more eggs were laid under nutrient poor conditions, the production of eggs stopped after 4-6 days and the decline in Spiroplasma titers under nutrient deprivation are only observed after 8 days. If transmission were to decline after 8 days on nutrient poor media, then the early increase in egg production induced by Spiroplasma under these conditions would make evolutionary sense. We also quantified Spiroplasma titers in virgins and mated flies after 14 days on rich media and found no significant difference (unpublished data). This would suggest that Spiroplasma titers are not directly linked to the rate of egg production (since virgins lay many fewer eggs that mated flies). We would like to thank Laure Beven, Wilhelm Palm, Barbara Herren, Roshan Vijendravarma, Steve Perlman, and Melanie Blokesch for informative discussions and suggestions regarding the manuscript. We would like to thank Suzanne Eaton and Ronald P Kühnlein for donating fly stocks and Ryma Acheraiou for assistance. We thank the TRiP at Harvard Medical School (NIH/NIGMS R01-GM084947) and the Bloomington stock center for providing transgenic RNAi fly stocks used in this study. This work was supported by an ERC Advanced Grant. © 2014, Herren et al.